« WHAT DOES GOD WANT? Take your pick: the Auschwitz concentration camp, 9-11 terrorist attacks, massacres in Connecticut (2012) and Norway (2011), barbaric ISIS warmongers. These, and many other horrific examples of human evil, can serve as evidence of why there is no God. I certainly understand how people can adopt this viewpoint. But I also understand that this is the path of least resistance; the conclusion any of us could jump to in the heat of anger and despair. 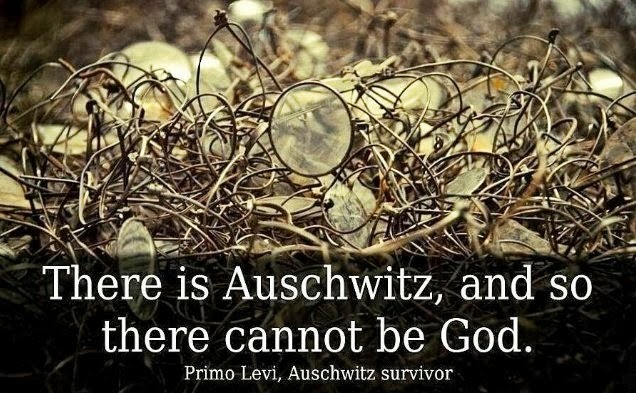 So I’m going to advance a very different proposition: there are Nazi death camps, vicious ISIS/Al Qaeda terrorists and rampaging “lone wolf” killers, so there MUST be a God. 1. The beautiful and terrible gift of freewill. We’ve been given it. And we spit on it. Every day. That absolutely includes ME, when I act as if there is no God and put myself in charge of me. When you and I claim we know what’s best for ourselves, we open the door to greed, unbridled lust, petty self-centredness, intolerance and so much more. Like it or not, this path can lead all the way to unspeakable evil. 2. Who gave us that gift of freewill? Who else but God, the creator of this universe and the air you are breathing right now? Does that mean He’s responsible for when we do wrong and fail to do right? Not even a little bit. God didn’t want goose-stepping robots; he wanted people with freedom. And he still wants that, no matter how hard it has often been. 3. Who can we turn to when despicable evil happens? God, who gave you air to breathe and free will to believe in Him or turn away and rely on yourself. Notice how we haven’t been simply abandoned to free will and all it’s potential consequences? In the midst of Auschwitz, Jesus Christ was there, offering people hope of eternity in Heaven with Him, long after the suffering ended. And with that knowledge came His strength and a willingness to forgive their Nazi torturers and escape the prison of rage and revenge. In camps where refugees are living with practically nothing, just so they can escape ISIS terrorists, Jesus Christ is there, offering them more than blankets and food. Offering them His love and eternity with Him when this short life is done. In the aftermath of massacres, Jesus Christ is there, offering a community of believers who are, in their midst of their own imperfections, ready to provide physical and spiritual help. To be the hands of feet of their Lord and Saviour. Getting in on all this is simple. Accept the gift of Jesus, whose sacrificial death makes up for all your sins. Make Him your Lord and friend. Then watch as changes start to happen. Good changes. Changes that will take you into eternity. Does this sound attractive? Yes or no, post your thoughts below and let’s have a conversation. Amen, Frank, amen! God is here with us. He abides with us. He loves us in all circumstances. We are so blessed to have our Savior! We are so very blessed to have Jesus! We need to continue to be his hands and feet. Intense brother! AMEN! Just as a husband would wish a wife that CHOOSES to be with him, while knowing she could be with anyone else in the world, I have learned to understand that as why He gave us free will. As you said, He doesn’t want robots! My first thoughts are, why think about something that was over 2,000 years ago? Does knowing how truth can get very distorted over the years never mind millennium make this anymore than a supposed event with no evidence? I once shared time with a blind man who meditated most of the day. His opinion of the Hitler incarnation was that he volunteered for that job. I find this to be a VERY broad perspective that was accepted in spiritual circles. I also shared time with a Spiritual Master from the Himalayas whose opinion was Hitler was considered an Angel by God due to the magnitude of the lessons he taught the human race by his actions. I have done Past Life Regressions on many people and have found WE ALWAYS CHOOSE our role in this life just prior to birth in it and just after death of our last incarnation. This validates that a lower conscious person does not choose a higher conscious incarnation. If we try and perceive major events from previous lives to examine the evidence so to speak, how do we possibly do this when we spend most of our time in our lower self trying to only just perceive our higher self? Thanks for your thoughts, Rich. Why “think about something that was over 2,000 years ago?” Because it’s relevant right here and right now. It’s absolutely timeless. Jesus is absolutely timeless. Very interesting is the question asked and the answer to some that I read here. The horrors of war and terrorism had committed no excuse. The reality of human frailty there is no limit to God and should not be received. What people have good and bad features, the question is which is going to become more pronounced in the innermost soul énjéből. Here I refer to the “faith” to move mountains between. It does not necessarily keep church and attend church must feel in our souls within it. I know from the Bible that God created man in his own “image” created man, so I think that deep down in our souls to feel the existence of God. I venture to describe it, because it happened to me a positive thing, which I did not find an explanation. You have to leave the possibility for everyone to believe in that which he wants. I do not think it not unfortunate that people are believers and atheists categorize, because it may be a chimera is reported to believe in God, but who are also not dare to take it for some reason. Great-great majority of people in the world love the homeland, even if major wars, disasters or pulled out. The advancing age of the person thinks differently, so forgive us find as soon as possible, because that ‘short’ life on earth, and anger is very bad advice and makes life bitter. Whether there is a heaven ?! I do not know, I do not know …. I think that there is a planet, perhaps in a different dimension, where there is a higher degree of expertise in people, not arise where the person unworthy of the slightest germ of true either, and they can cooperate with nature.